Last week, the University of North Carolina rolled out a new social media. Instead of increasing access to student athletes, the policy has coaches and/or administrators serving as the social media director for their team (read more here & here). Seems a bit extreme pulling folks more astute with X’s and O’s and game planning to monitoring 140 character messages. Aside from tapping our resident sports guys, we also tapped into the psyche of a pair of UNC alumni to see what they thought of this new plan. For those of you counting at home, there are four contributors to this post, a first for PRBC. I spent four years walking around campus just hoping I’d get to catch a glimpse of guys like Tyler Hansbrough and Danny Green. 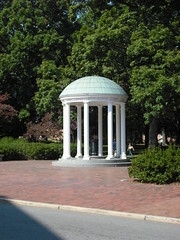 At Carolina, tests and presentations were often rescheduled because the team had made it to the next round of the tourney. I will forever bleed blue and cheer for Roy’s boys. When guys like Marcus Ginyard started to join Twitter, I was thrilled because it was probably the best way for me to get to know UNC players and show the team support. Censoring and monitoring these guys only takes away the authentic interaction they have with fellow classmates who may not get the chance otherwise. Yeah, that sounds a bit lame, but wouldn’t you want to interact with a basketball legend one-on-one if you could? Beyond this loss of authenticity, the spirit behind the new rules is also an issue. UNC’s undergraduate journalism program is considered one of the best in the country, and to have the school’s athletic department enact a policy like this is just plain embarrassing. UNC recently unveiled an updated social media policy that has been called “harsh” – and while the UNC alum in me might agree, the B2B PR pro has to admit the policy just makes good business sense. And let’s be honest – isn’t college athletics really a business these days? ● Responsibility & Good Judgment: Student athletes, whether they like it or not, are representatives of their University. As such, they need to exercise good judgment when posting on public forums and refrain from comments that could negatively impact the “organization.” And the “organization” needs to pay attention to what’s being said. ● Audience: Students and fans are an important audience for UNC athletics. They’re the “consumer;” the buyer of UNC’s “product.” Therefore, UNC has a responsibility to consider what posts/comments might alienate its fan base. ● Consequences: A sound social media policy should address the consequences for “bad behavior.” UNC has experienced first-hand the risks associated with social media and they’ve created a policy that, they hope, will mitigate them. All that being said, the devil is always in the details. With the ability to monitor and even remove posts, UNC could take the policy too far – and if they do so, miss out on an opportunity to engage its fan base via social media. Congratulations, NCAA! The University of North Carolina has helped you further blur the line between enrolled student and paid employee. In Chapel Hill a coach or administrator will be monitoring players’ social media accounts for violations. Yes, that’s a public university chipping away at the students’ individual rights – sounds a little fishy to me. How much control over a person does their university have over them? Should they have access to student-athletes’ social media accounts, as the policy demands? And why just student athletes? What about student government, student media or student workers? Seems like the college is flexing their muscles to protect their revenue generating assets. Do you actually think the star point guard will be judged on the same scale as the back-up women’s coxswain? It may sound crazy, but this policy is a good thing. While my co-contributors raise some valid objections, they are missing the silver lining in this grey cloud. College is a place for kids to get an education and foundation for a future career. Sure some of the players affected by this new policy will play with balls for a living, but the vast majority of the student athletes will not. Either way, they need to learn the professional implications of being a dumbass on social media. We’ve all heard horror stories of people getting fired and some of us even monitor what is being said about a company online and may see dumb things posted co-workers. Sure getting to know these athletes may be cool, but they are representatives of a brand. How many brand reps do you know that really give 100% behind the scenes access? Twitter is big business and if that means some big brother so be it. The athletes who do turn pro will have stricter regulations from their respective leagues. Just as Chad Ochocinco how much a tweet can cost. Well there you have our in-house experts’ perspectives. What do you think of the issue? Rebecca, Mike, and Jeff are PRBC regulars. You can get their contact info and details, as always, right here. Aven James, a first time PRBC contributor, is a Senior Account Executive at Bliss PR (yes, Elizabeth Sosnow’s firm – another PRBC regular) where she focuses on media relations in the B2B and professional services sector.